Photine the glorious, the crown and glory of the Martyrs, hath this day ascended to the shining mansions of Heaven, and she calleth all together to sing her praises, that they might be recompensed with her hallowed graces. Let us all with faith and longing extol her gladly in hymns of triumph and joy. 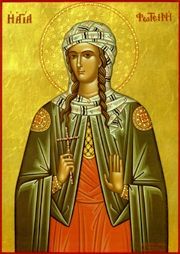 Share the feast of The Holy Great Martyr Photine, the Samaritan Women with an icon greeting ecard.